If you’ve picked Icmeler as the dream-spot for your precious vacation, but you also enjoy doing extensive sightseeing while on holiday, we have the perfect offer for you. 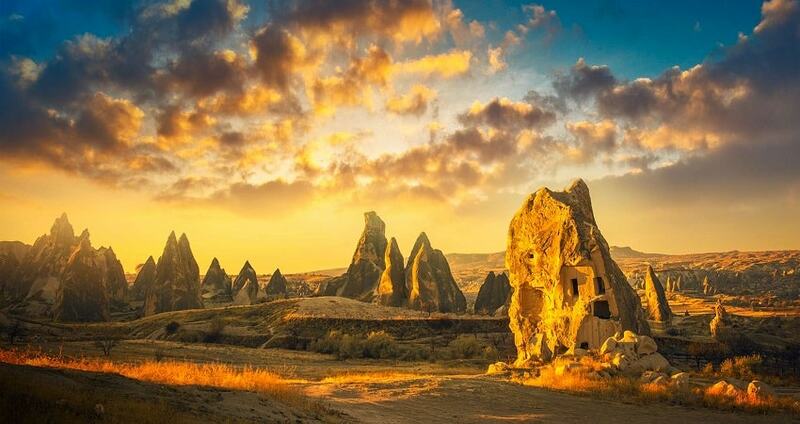 Our Icmeler Cappadocia Tour will show the best of what Turkey has to offer. You will get to see some amazing sites, enjoy some terrific food and learn something new about our beautiful country. Icmeler Cappadocia Tour begins with a long but comfortable drive from Icmeler to Cappadocia. The trip itself lasts for some 13 hours, but you shouldn’t be worried, as you will be traveling in the best busses, fully equipped to make this lengthy journey as enjoyable as possible. The busses are of the brand Mercedes Trevego of the Rahmi Hamurcu, the most prominent Turkish bus company. We have also arranged for some catering during the ride, so you will be able to have a refreshing beverage, or a yummy snack while traveling. We will reach the Cappadocia Inn at about 7am, and after a delectable breakfast at the hotel we will go on our marry way to North Cappadocia. 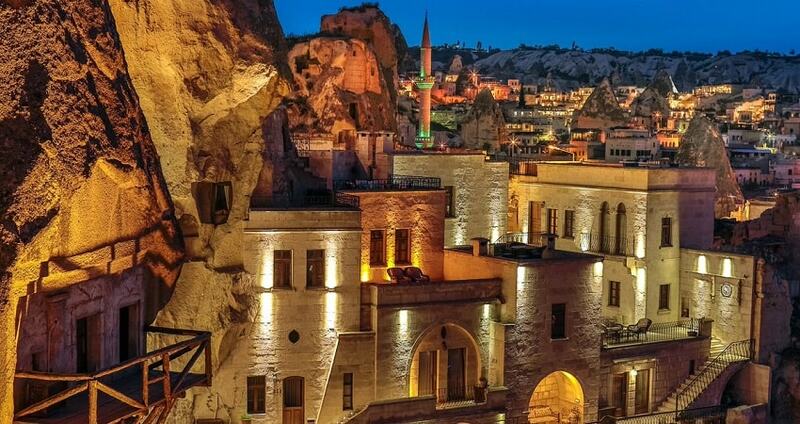 Our first stop in Icmeler Cappadocia Tour will be at the phenomenal Uchisar Castle. This lovely castle includes hidden rooms and secret tunnels cut into the mountain rocks. Although all of the rooms probably had a very different purpose, today those on the north side became dovecots that house hundreds of pigeons each year. 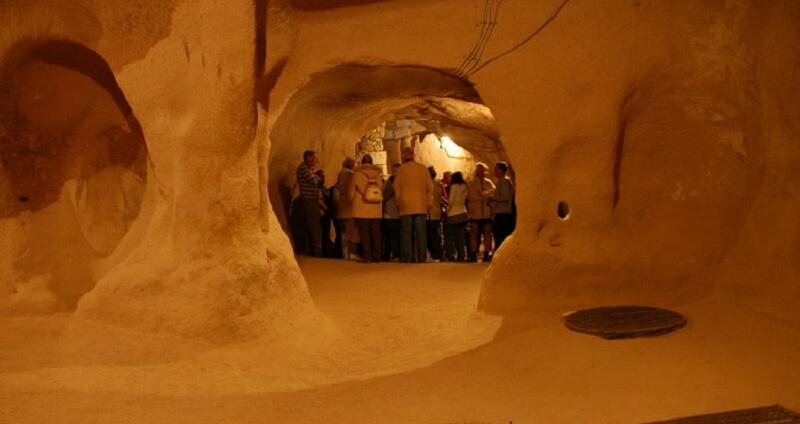 Our second stoppage will be at the famous and very significant Goreme Open Air Museum. This terrific site consists of numerous cave churches painted with some of the most remarkable frescoes of the time. It is also important to note that this particular site was one of the first in Turkey to be protected by UNESCO as the World Heritage Site. 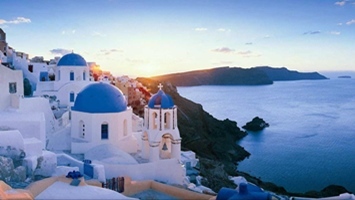 We will visit several churches here, such as Elmah Church or Apple Church, and Yilanli Church or Snake Church. Our next visit is to the Cavusin Old Village, where we will visit the rather large cave church of St. John the Baptist. Next among our destinations is the lovely Pasabag or the Monkey’s Valley that host some unique and fascinating fairy chimneys topped by double and triple hats. The valley also has its own marvelous chapel which is dedicated to Saint Simeon. While here we will also see a hermit’s shelter, created in one of the chimneys with triple hats. Once we’ve done our sightseeing through Pasabag, we will have lunch and move to Avanos. At Avanos we will get familiar with their process of making special red pottery. This pottery is made of red clay which gets collected from the Red River. We will then visit the strange-looking Devrent Valley, where you will get to see some impressive rock formations that look almost otherworldly. 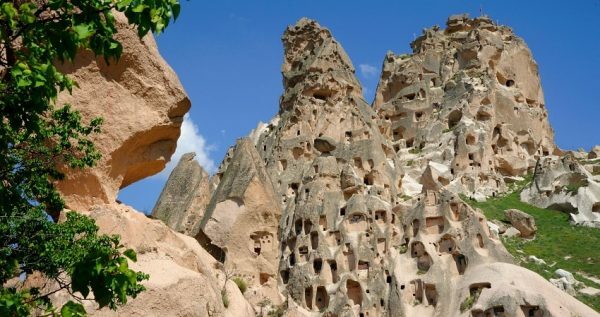 We will then visit Urgup to see its bigger fairy chimneys, and then we’ll stop at Goreme to visit a Turkish carpet factory. Our driver will later take us back to the hotel where we will have the rest of the day free to rest and relax. If you like trying new things and you’ve never flied in a balloon, then we have just the offer for you. Our terrific tour will give you the unique opportunity to see Cappadocia from a bird’s perspective. You will get to see its amazing mountains and valleys while being up in the fresh morning air. The tour starts early in the morning of the second day of your stay at Cappadocia. Our chauffeur will drive you to the take-off site where you will have a light breakfast. Afterwards, you will receive some instructions from our experienced instructors, and then your adventure can begin. This tour can be Standard, with which the flight lasts 1 hour, and it can be Deluxe, with which the flight lasts 1,5 hours or more. Our second day in Icmeler Cappadocia Tour will start with a tasty Turkish breakfast, after which the driver will take us to Derinkuyu. Once we reach Derinkuyu we will continue the trip on foot. 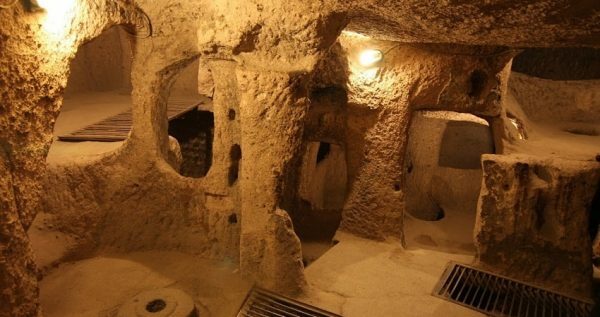 Our fist stop will be at the ancient underground Hittites city, which consists of numerous underground rooms, passages, stables, a school and much more. Our next visit will be to the Ihlara Valley. We’ll be walking down the Melendiz River, looking at some amazing poplars, lovely old vineyards and pistachio trees. This valley also has a hundred cave churches, and we will visit some of them. Their inner walls are covered with some delightful frescoes with lengthy texts. 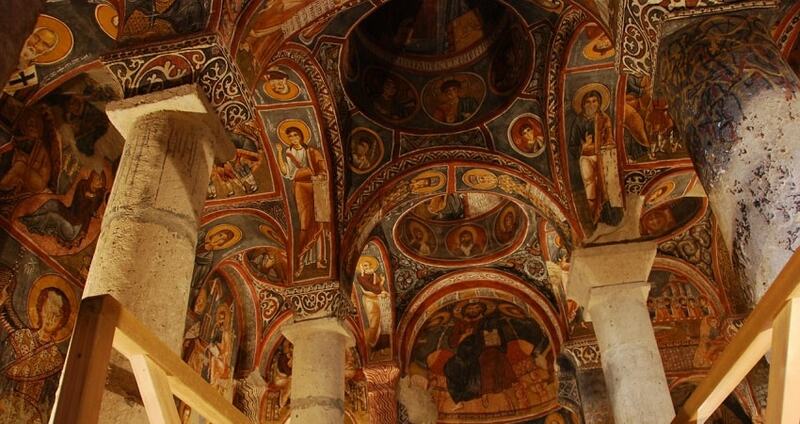 Afterwards in Icmeler Cappadocia Tour, we will have lunch and move to visit the stunning Selime Monastery. This rock-cut church is famous for its spaciousness and it contains, quarters for monks, a large kitchen area, and a stable for mules. Our next stop will be at the Pigeon Valley. This huge valley got its interesting name because it has hundreds of dovecots in tis mountain rocks. It remains a mystery why there are so many pigeon houses here. In the end, we’ll have a stoppage at the prominent onyx factory, where you will learn something about these precious gems and how they are created. At about 6pm our chauffer will take you to the bus station, where you will be free to do whatever you like till 8pm, when our bus will come to drive you back to lovely Icmeler. Please remember hot air balloon tour in Cappadocia is optional and has to be booked separately. 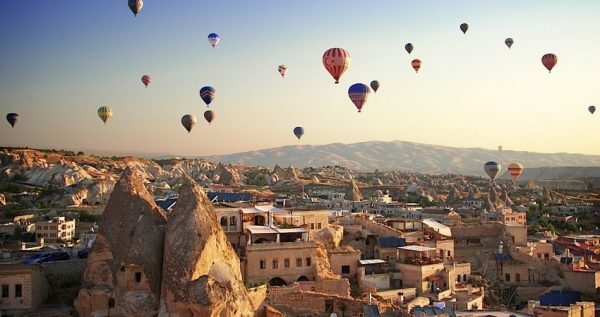 If you plan to travel to another destination from Cappadocia, you can also book this tour one way. You will be staying in Cappadocia Inn Hotel but depending on the reservations we may offer another hotel with similar standarts. If you like overnight excursions then Ephesus Pamukkale Tour can be also interesting. Our awesome Icmeler Cappadocia Tour starts with a bus drive at 6pm. You will be traveling in our delightful and comfortable busses, while being catered with refreshing drinks and snacks. All of the busses have air-conditioning, so the trip should be very enjoyable. We are expected to reach the Cappadocia Inn at 7am. Once you are checked at the hotel, you will get to freshen up a bit, and have a breakfast with the rest of your group. After a yummy breakfast, you will board the bus and start your tour through North Cappadocia. Our first break will be at the extraordinary Uchisar Castle. This interesting castle has hidden rooms and secret tunnels carved within the mountain rocks. The rooms on the north side became dovecots throughout the years and nowadays they house hundreds of pigeons. Our second stop will be at the renowned and very important Goreme Open Air Museum. 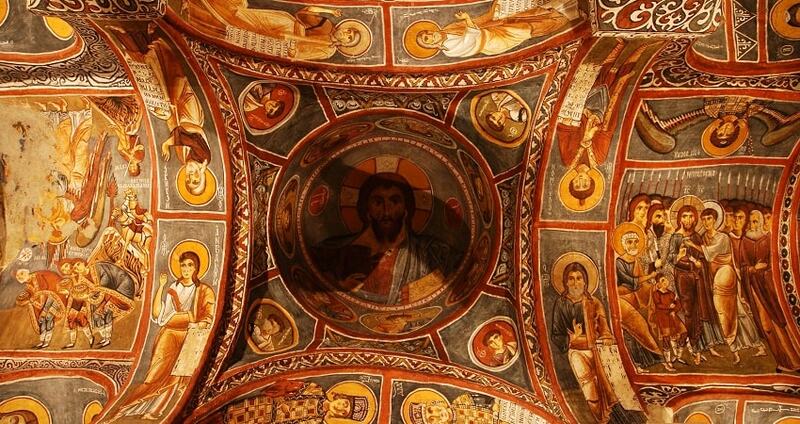 This alluring site hosts numerous cave churches containing some of the most impressive frescoes of that time. We will go inside several churches, like Elmah (Apple) Church, and Yilanli (Snake) Church. We will then visit the Cavusin Old Village, where we will get to see the rather spacious cave church dedicated to Saint John the Baptist. Next destination in Icmeler Cappadocia Tour is the remarkable Pasabag also called the Monkey’s Valley that contains some unusual fairy chimneys that look like mushrooms with double and triple hats. The valley also has an exquisite chapel devoted to Saint Simeon. One of the lovely chimneys with three hats also has a hermit’s shelter carved into it, so we will get to see that as well. We will have lunch while we’re in the valley, and then we’ll move to Avanos. At Avanos we will get to witness the making of some of their world-famous red pottery. The locals get the red clay used for the pottery from the Red River. We will then go to the bewildering Devrent Valley, where you will see some intriguing rock formations that give this valley the appearance of a moonscape. 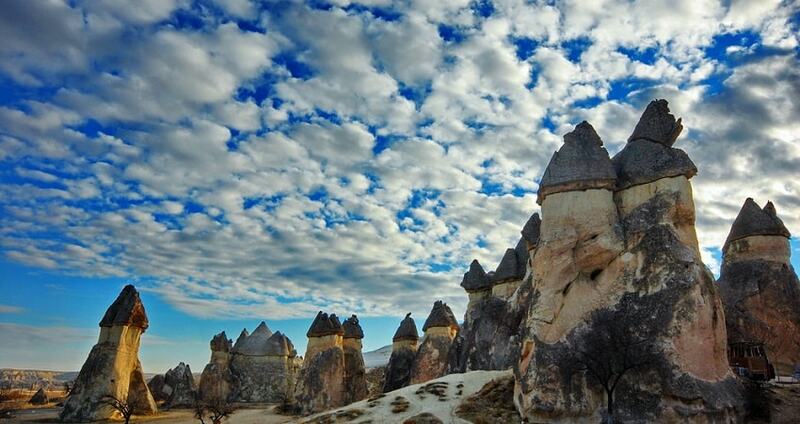 Then we’ll head to Urgup to see its fairy chimneys, and we’ll make a stop at Goreme to visit a carpet factory. Our driver will the drive us back to the hotel where we’ll have the rest of the day off, so we can rest and relax. If you have a flair for experiencing new things and you never tried flying in a balloon, then we have the perfect offer for you. 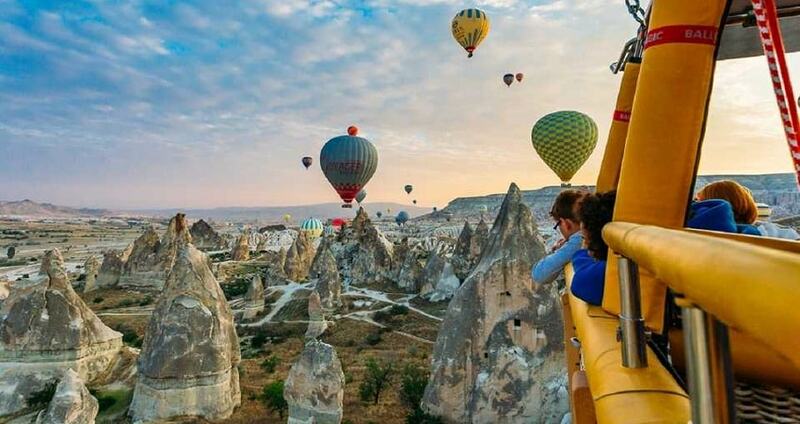 Our unique tour will give you the amazing opportunity to observe Cappadocia from a hot air balloon. You will get to see the sharp mountains and soft valleys of gorgeous Cappadocia while gliding through the fresh morning air. The Hot Air Balloon tour starts early on the second day of your Cappadocia tour. Our chauffeur will pick you up and drive you to the site where you will meet our instructors and have a light meal. You will get some basic and necessary info about the tour, and then the flying-escapade can begin. We offer the Standard Hot Air Balloon tour (the flight lasts 1 hour) and the Deluxe Hot Air Balloon tour (the flight lasts 1,5 hours or more). Our second day will begin with a replenishing Turkish breakfast. After the tasty breakfast the driver will pick us up and we will head to South Cappadocia. Once we get to Derinkuyu we will resume our tour through the southern part of Cappadocia on foot. Our first break will be at the amazing underground city of ancient Hittites. The city consists of many different underground rooms, stables, tunnels, a school as well as numerous other areas. We will continue through the Ihlara Valley. We’ll take a long and slow walk down the peaceful Melendiz River, enjoying the view of some lovely poplars, charming old vineyards and wonderful pistachio trees. This valley features 100 cave churches, and we will get to visit some of them. At 6pm our driver will take you to the local bus station. There you will get free time for two hours, when our cozy, spacious bus will come to take you back to lovely Icmeler. The tour price of Icmeler Cappadocia Tour includes amenities such as bus tickets, entrance fees, full insurance packages, two lunches and two breakfasts, guiding services, and overnight stay at the Cappadocia Inn.